A lightly used, fully working NTP server that has been tested to confirm that it works as it should. It requires a 12V outdoor antenna which is not included (I usually have some suitable AT575 types listed separately). No printed manual is included but a copy may be downloaded here if required. Note that no antenna or rack ears are included. If you want either or both added to the package then feel free to email me and I can edit the listing accordingly. This is a GPS Master Clock receiver that has RS-232 and Ethernet interfaces. Input voltage is universal 100-240 V AC. A comparison of the different Symmetricom products is available here. Full details may be obtained from the Product Manual. The receiver locks onto a GPS signal when the antenna has a reasonable view of the sky. The status indicator then turns to flashing green - indicating that time has been successfully acquired with no problems detected. In summary, if you want a GPS Master Clock unit to acquire the correct time and to provide an accurate NTP time reference to client devices over a LAN or WAN then will work for you out of the box. The unit has been confirmed to operate correctly via the serial console port and the loaded firmware is the latest posted version (ie. Version 8.4). The passwords are set at their default values (operator:mercury). 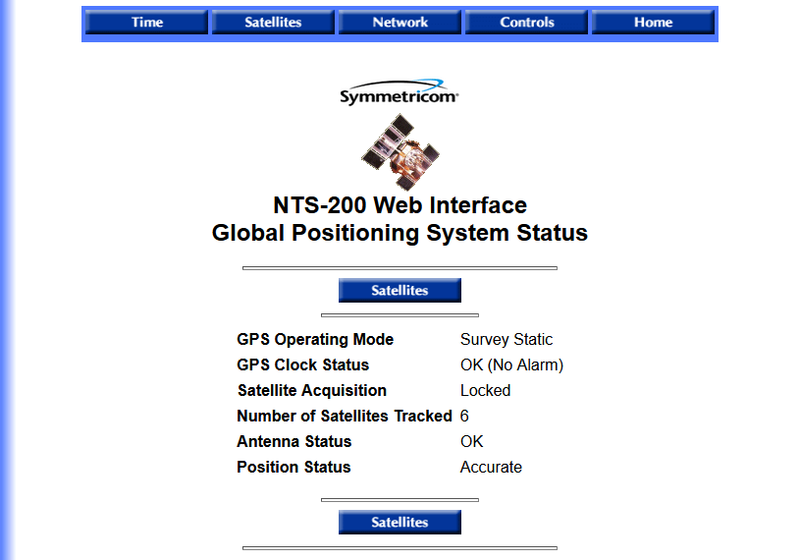 The NTS-200 is a high-performance Network Time Protocol (NTP) server that reports time with extreme accuracy, using the Global Positioning System (GPS) as a synchronization source. The NTS-200 supports versions 2 and higher of the NTP, RFC-1305, as well as the Simple Network Time Protocol (SNTP), RFC-2030. 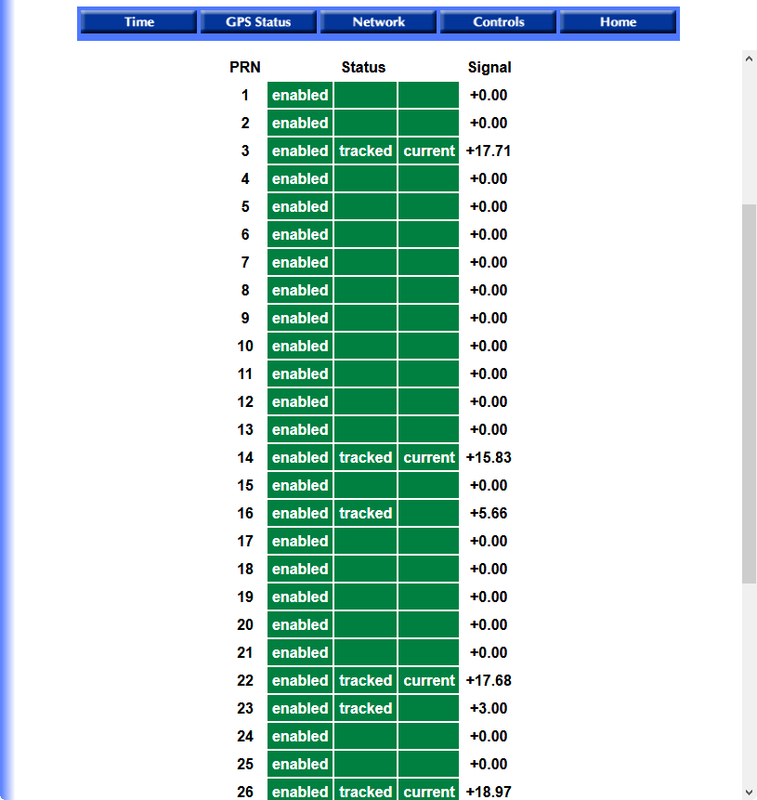 In addition, the NTS responds to TIME protocol requests, RFC-868. 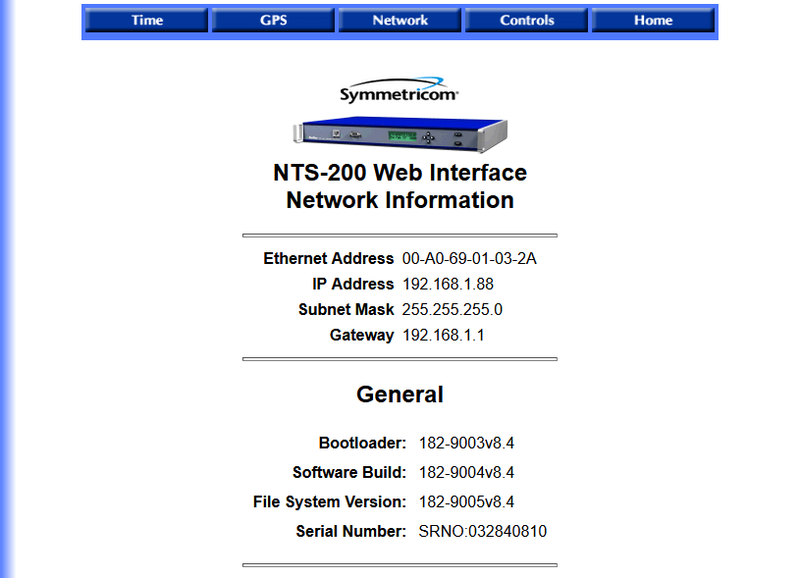 The main feature of the NTS web interface is its ability to perform setup and control operations from a remote location, using the Internet or TCP/IP LAN. The protocol used is either Telnet or HTTP. The NTS has an RJ-45 Ethernet connector on its NET Port, providing NTP and IP access, and a 9-pin D serial connector for serial input/output.